5 ACRE HORSE FARM with POSSIBLE OWNER FINANCING. Ideal location just off County Road 326 in Morriston. 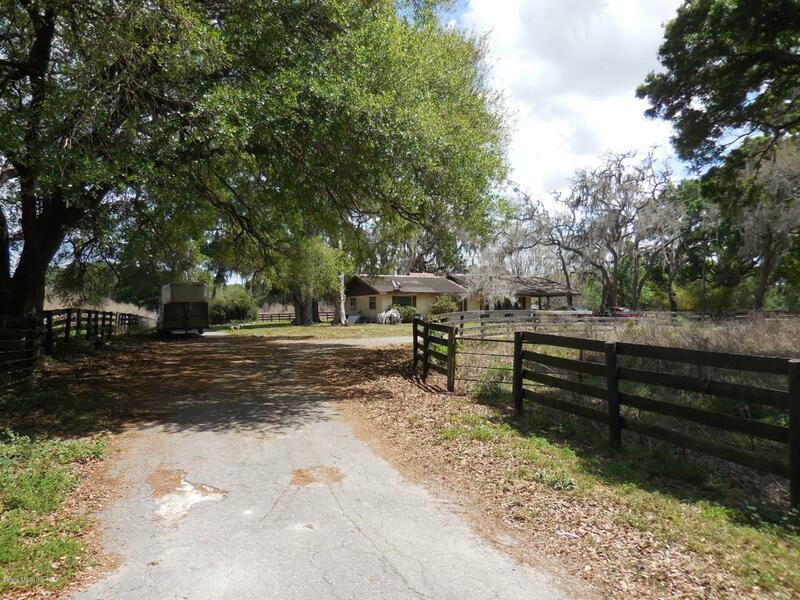 Surround yourself with large oaks on this fenced and cross fenced move-in ready horse farm. Large, Concrete block 6 stall center isle barn complete with tack room and storage, 4 paddocks, gated entry with paved driveway. Recently renovated concrete block home with 3 bedrooms, 2 baths and great screened porch overlooking the large paddocks. New roof and A/C. Bring your horses and the family to the country. Listing provided courtesy of Marc Pompeo of Harriett Downs Real Estate Llc. © 2019 Ocala/Marion County MLS. All rights reserved. IDX information is provided exclusively for consumers' personal, non-commercial use and may not be used for any purpose other than to identify prospective properties consumers may be interested in purchasing. Information is deemed reliable but is not guaranteed accurate by the MLS or Bosshardt Realty. Data last updated: 2019-04-24T22:31:47.027. © 2019 Gainesville MLS, Inc. All Rights Reserved. Information deemed reliable but not guaranteed.The Broker Reciprocity logo designates real estate listings held by a brokerage firm other than Bosshardt Realty. IDX information is provided exclusively for consumers' personal, non-commercial use and may not be used for any purpose other than to identify prospective properties consumers may be interested in purchasing. Data last updated: 2019-04-24T22:06:58.24.